Although Papua New Guinea was once an unfamiliar name in international football, the Youth Olympic Football Tournament has brought this Oceanic island nation to the world’s attention. Following their participation in the inaugural Girl’s Youth Olympic Football Tournament in Singapore, the Kurakums (or “weaver ants”) have returned to the international spotlight with a 7-0 opening-day defeat by Venezuela. In their debut appearance back in 2010, the Pacific islanders lost all three of their games without scoring. Ahead of this latest campaign, coach Margaret Aka said that her charges should strive to improve on the performances of four years ago by "going for goals and going out to win". But despite watching her compatriots lose again in their opening fixture, the former national team striker does not seem overly despondent. "The players did their best and deserve credit for their performance," Aka told FIFA.com after the game. "We put up a good defence in the first half and our tactics were spot-on. It’s fair to say that the girls played the game we wanted to see." Aka’s words make perfect sense considering how far the country has come. For a young footballing nation that only established a football association in 1962 and joined FIFA in 1966, contesting a Youth Olympics is about more than just getting results: it is about taking part and developing. While the performances last time around in Singapore provided little to cheer about, Aka still remembers the buzz that this very tournament created in her homeland four years ago. "At that time everyone was so excited that we were participating in the Youth Olympic Football Tournament!" she recalled. "I'd already started working as a coach and my players and I were all following the games." According to Aka, that first experience of a major international competition had a lasting impact on the development on women's football in the Pacific nation. "[After the inaugural YOG] we gradually introduced male and female development plans at all ages, including at U-20, U-18 and U-16 level. In September last year we staged a Girls’ National Youth Championship, from which we selected the backbone of this current Youth Olympic team. We then selected some new additions after I took over this year." Few people appreciate how difficult it is to train up a football team in a country consisting of more than 600 islands. "Normally we set a training time and arrange for players living on different islands to travel by plane or ferry to the registration venue. In this way, since April we have held three training sessions and played a total of three matches, including against the national U-15 boys side and a mixed team made up of U-18 and U-20 players. After coming to Nanjing, we played another two matches against local teams in Jiangsu. " 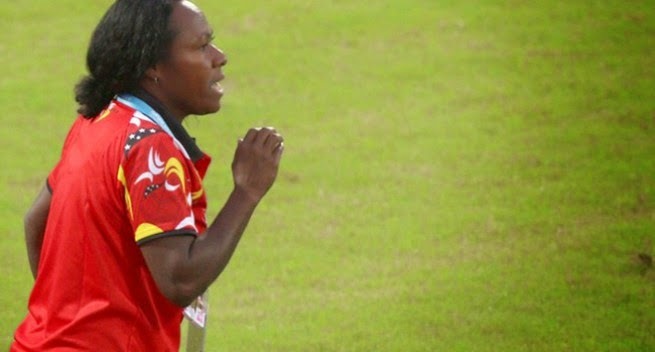 Papua New Guinea’s head coach believes that her protégées’ first taste of competitive action will have helped them to settle into the tournament. "The players have arrived in Nanjing, seen how good the training and competition facilities are and come into contact with people from all over the world. It’s all a culture shock, which facilitates the players’ progress," she said. After losing their opening fixture, the chances of the Kurakums reaching the semi-finals are slim, especially with another tough test against disciplined European contenders Slovakia to come in six days time. Nevertheless Aka is expecting an improved showing from her girls: "With that first match experience the players won’t be so nervous, they’ll play better. [Despite losing the opening game] We will prepare hard and strive for a better performance.”In fact, Aka is looking even further ahead: “Did you know that many of the players in that team four years ago have since become the mainstay of the national youth side, which achieved very good results at this year's OFC U-20 Women's Championship?” she pointed out, alluding to the islanders’ second-place finish in the continental tournament, courtesy of successive 4-0 victories over Tonga and Vanuatu followed by a respectable 3-0 loss to New Zealand on the final match day.“Some of the players were even called up to the national squad for the OFC Women's Nations Cup, while our captain Margret Joseph once trained with the national senior side. So I hope that my team is full of hope, because they represent the future of women's football in our country," concluded Aka with a glint of pride in her eyes.